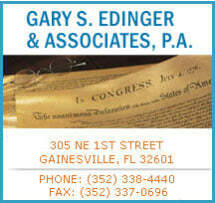 GARY SCOTT EDINGER graduated in 1986 with honors from the University of Florida Law School. He is currently a sole practitioner in Gainesville, Florida with a wide-ranging civil practice (general litigation, appeals, corporations, contracts, real estate - the usual). His first love and the emphasis of his practice is First Amendment litigation for a mix of adult and political clients. Within that area of practice, his primary interests are the law of prior restraint (licensing) and zoning issues.